You will experience local up and coming small businesses whom have been individually sourced with specialty foods, artisan products, unique home, and fashion accessories plus Local ciders, beers and wines tasting from across the Region. Some of the most amazing club permit and vintage cars will be on show and rides, activities for the whole family. 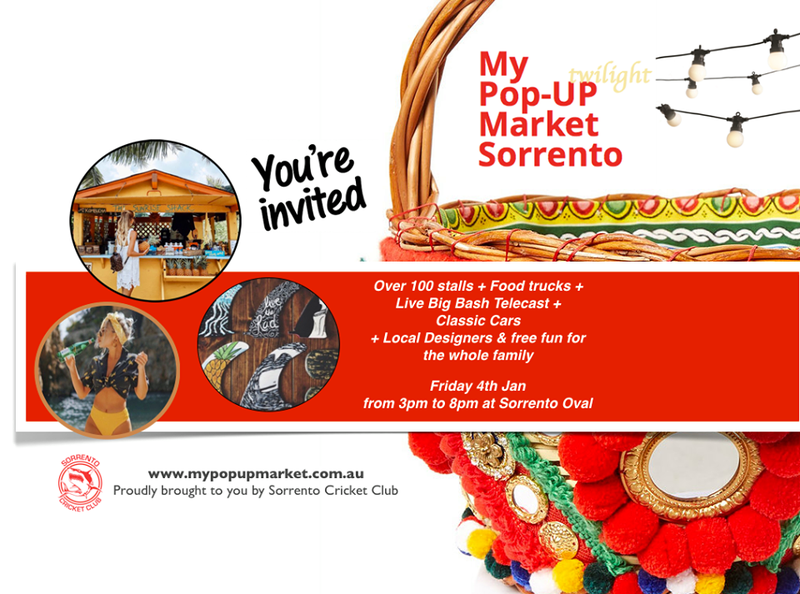 The My Pop-Up Market Sorrento- a project by the Sorrento Cricket Club to offer the community a free, family friendly event for all to enjoy over the summer season. It's a one afternoon only event so we suggest you bring along family and friends to check out the talent on show. So come along and bring your market bag and picnic blanket so you can chill and listen to the tunes while indulging in some local fun filled atmosphere.